Looking for the top natural gas stocks for 2015? Check out this list -- you might find exactly what you're looking for. America's oil and gas industry has exploded over the past several years, and a lot of great money has been made. However, oil prices are down 30% since June, and OPEC and U.S. oil producers are facing off in a battle for market share as global demand stagnates. It could be months before either side blinks, and oil prices could fall even farther before something changes. While that's happening, demand for natural gas remains strong, and as it's largely a domestic commodity, a cartel like OPEC can't manipulate global prices. 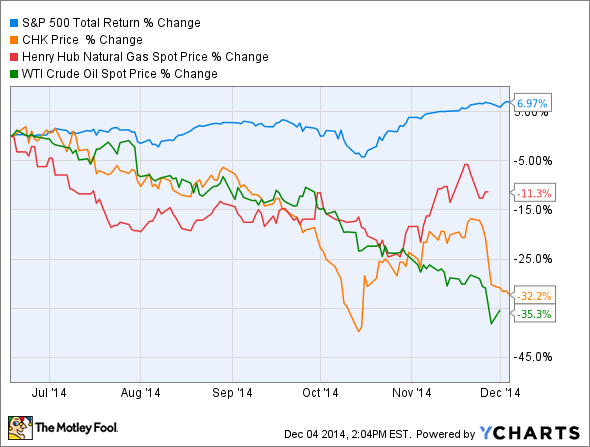 Looking for the top natural gas stocks for 2015? Here are some of my favorites -- there's a chance one of them could be perfect for your portfolio. Let's dig in. Kinder Morgan (NYSE:KMI) is the dominant midstream operator in North America, with more than 80,000 miles of pipelines, and 180 storage facilities and terminals for natural gas, oil and oil distillates, and raw materials, including iron and coking coal. Kinder Morgan's business -- moving natural gas and other products from where it is produced to where it is consumed -- is much more driven by demand than by the market price of the products. For investors, this means a large amount of protection from falling natural gas prices. Furthermore, the company's contracts with producers and buyers often run up to a decade (or longer) in length, and have minimum commitments, meaning Kinder Morgan has a huge safety net of predictable income for years to come. Kinder Morgan recently announced it would pay $2 per share in dividends in 2015 -- equal to a 4.8% yield at recent prices. That's a 17% increase from 2014's payout, and it should be easily sustainable. The company's recent move to acquire and merge all of its MLP interests should lead to lower cost of capital, further supporting future dividend growth. Including dividends paid, Kinder Morgan is up 20.6% in 2014 and has a huge tailwind of demand that supports many more years of strong returns. However, this perspective ignores two factors. In short, two-thirds of the company's 2014 oil production was hedged at more than $90 per barrel. In the past, Chesapeake has been accused of "over-hedging" and leaving profits on the table when oil and gas prices were high. However, its aggressive hedging activity could be a major boon for 2015, with 16.8 million barrels -- probably more than one-third of its oil production -- already locked in at $93/bbl. That could be worth nearly 50% more than market price early in 2015. While that's happened, the company has continued to grow revenues and fuel deliveries significantly. If Clean Energy Fuels has made one mistake over the past few years, it's being too soon to the party. The company has built nearly 100 LNG refueling stations for over-the-road truckers, but a year-plus delay in bringing a suitable engine to market by Westport Innovations and partner Cummins, has left more than 70 of those stations yet to be opened. The good news? Since being launched about a year ago, the ISX12 G engine has performed well, and Westport has reported that sales of engines for trucking applications is growing. For Clean Energy, deliveries of both LNG and CNG have increased between 10% and 20% annually since 2011, and the company looks to be on pace to reach adjusted EBITDA positive earnings early in 2015. Furthermore, the company is well positioned to expand -- because of all those constructed stations -- without investing as much in capex over the next year or more. It's important, but just part of the story, and Mr. Market is looking past the recent acquisition of a controlling stake in NG Advantage. Not only did the company aquire what is now its largest refueling station, but it stepped into a business that could be as large for it as the heavy truck refueling business, and maybe with less competition. The company also said NG Advantage will be able to fund its capital needs from cash flows -- music to the ears of Clean Energy investors who've seen the company rack up more than $300 million in debt for capex in the past two years. There is risk here, but with the stock trading below $5, there is huge upside if you can stomach what will be a very bouncy ride. The reality is, nobody knows exactly what will happen in 2015; there are always a lot of unknowables in the short term. Clean Energy is certainly more speculative, but Chesapeake and Kinder Morgan have some real durable advantages that should make them great performers for years to come. 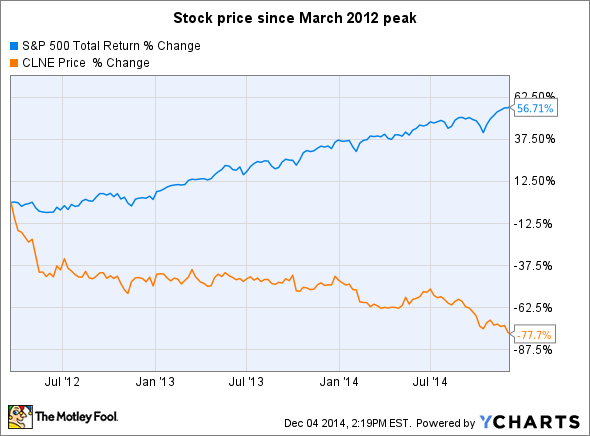 Disagree, or have another natural gas stock that you think is a better pick? Share in the comments section below.